Direct flights from Guyana to Aruba are on the horizon with the signing of a Memorandum of Understanding (MOU) between the two countries. The signing of the MOU took place on the sidelines of the ongoing 2018 International Civil Aviation Organisation (ICAO) Conference being held at the Liliendaal, Greater Georgetown Arthur Chung Conference Centre. 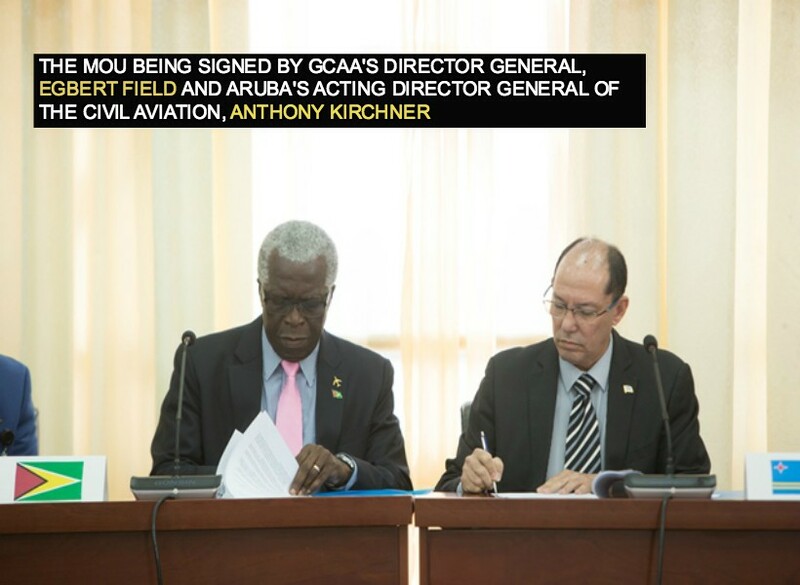 At the small but significant signing ceremony, Director-General of the Guyana Civil Aviation Authority (GCAA), Retired Lieutenant Colonel, Egbert Field, said the initiative began a few months ago after Aruba Airlines signalled its intention to begin flights to Guyana. Temporary approval was granted by Minister of Public Infrastructure, David Patterson for the airline to conduct its operation, after which the legal team exchanged the reviewed materials. This led to the signing of the MOU, which Field described as a “remarkable experience”. “We must proceed with open skies; that’s the view of this authority. We must go further afield in the signing of not only MOUs, but air services agreements. These instruments are the elements and basis on which airlines could ride on. There must be increased equipment, with this in place. Any airline wishing to operate in Guyana is invited to apply to conduct operations. The doubling of air traffic will have a boom for them. GCAA is happy to complete the agreement,” the Director-General assured. “It was a task to fulfil all the gaps but it is finalised and we hope to get more airlines between Guyana and Aruba. We also hope that we can arrange, with the help of Aruba Airlines, to have direct flights to Guyana and this agreement will definitely be the start of further negotiations in the future,” Kirchner related. In brief remarks, Minister within the Ministry of Public Infrastructure, Annette Ferguson said the signing came at an opportune time when Guyana is promoting air connectivity at the ICAO Air Transport Meeting. She noted that Guyana is on the verge of seeing more flights coming on stream, especially with the budding oil and gas sector. At the signing ceremony too, newly elected President of National Air Transport Association, Guyana and owner of Roraima Airways, Gerry Gouveia, lauded GCAA for its diligence in this accomplishment.